Cisco Webex Teams is one of the notable enterprise collaboration platforms. The app offers an ocean of features for teams around the world such as one-tap video conference, secure file sharing, and whiteboard animation. However, Webex Teams doesn’t natively support the sharing or management of files located in a different cloud storage environment. Simply put, if your organization uses both Webex and Dropbox for collaboration, you will need to login to the two accounts simultaneously to work with files. Today, we are going to show you how to add different clouds natively to your Webex Teams with Fuzebot and bring all your files within your conversation, no matter where they are stored. Fuzebot is a smart file assistant that brings all your files located in different cloud accounts within in a single-action reach. Now, it means you no longer need to compromise on your productivity by signing in and out of multiple accounts frequently. Fuzebot allows you to search, download, upload, share, and preview files directly from Webex Teams. This app detects files from over 40 file storage platforms. Tell Fuzebot what you need and have the top file options delivered directly to your chatroom. Simply use Fuzebot instead of logging into clouds, finding files, downloading documents and then sending information to colleagues. The smart bot will save you time while performing secure file retrieval within your conversation. Finding files can be time-consuming and counterproductive. 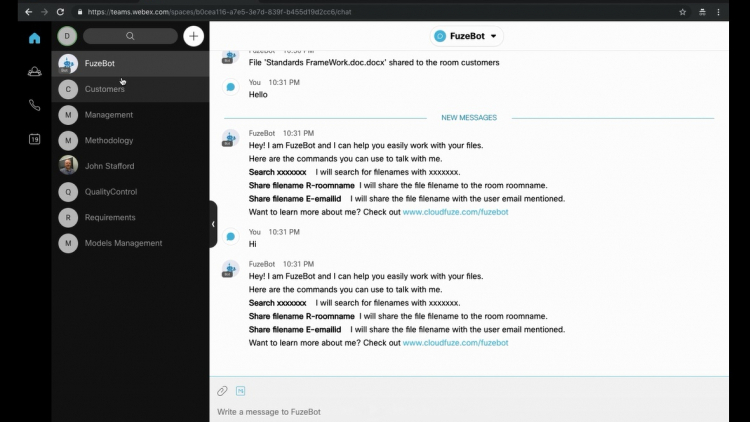 Instead of logging in and out of numerous storage platforms sifting through pages of information, simply address your personal Fuzebot assistant with a command to find the file you need. With Fuzebot, you can retrieve and share information instantly. Fuzebot integrates more than 40 cloud services including on-premise file systems such as NFS and NAS. Check out CloudFuze’s supported connectors page for the list. Just get in touch with our customer service team to get started. Alternatively, you can chat with one of our customer service executives using the chat window on this page.